We’ve all had those days where it’s cold, raining, and generally miserable, and all we want when we get home is some cheese smothered carbs (in my house, this is generally every day that ends with a y). I am a massive fan of good old fashioned mac and cheese, but I don’t always have the time, inclination or indeed, ingredients to whip up a roux, gradually add delicate rivers of milk and whisk whisk whisk until the mixture is perfectly smooth and lump free. So you can imagine my immense delight when I realised that there was a quick fix. No more weighing flour, no more melting butter. Just simple, tasty perfection in 20 minutes. 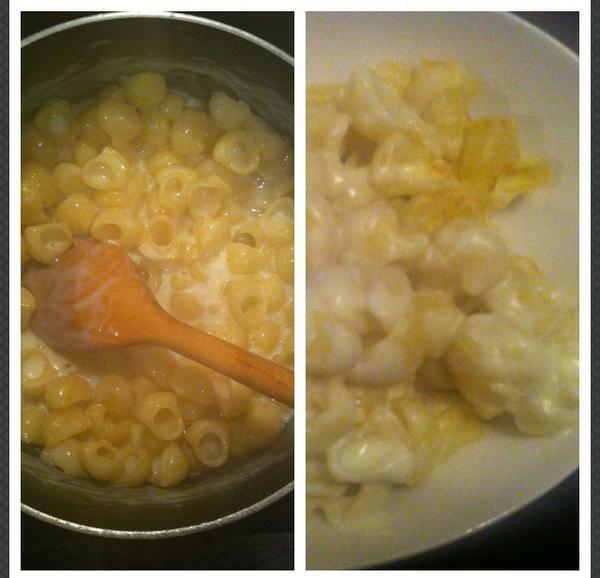 This entry was posted in Recipes and tagged cheese, mac and cheese, milk, pasta on November 15, 2012 by eleanor.